United Bank for Africa (UBA) Plc has announced the introduction of Value Added Services (VAS) on all its POS machines across Africa. With the new VAS on the UBA POS machines, UBA cardholders will be able to make payments for other services on the POS including Airtime purchase, Cable subscription, Electricity, Water and other bill payments on UBA POS machines. UBA has over 5000 POS machines installed with merchants across Africa. 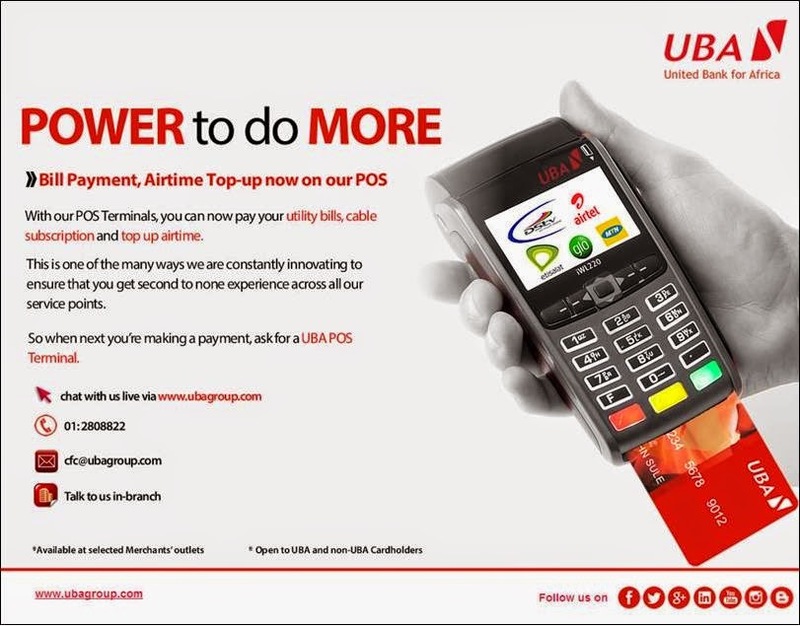 With the new services, cardholders can now pay their bills for PHCN, Pay TV Operators, Telecoms Operators, Regulated Lottery and Gaming Companies, Utility Companies, Schools fees, Government fees, taxes and dues as well as buy airline tickets on UBA POS machines. UBA is leading payment card issuer in Africa, with its cards giving card holders opportunity to shop both online and offline with millions of merchants in over 200 countries. UBA cards are highly secured and come with internationally certified security features. United Bank for Africa Plc is one of Africa's leading financial institutions offering banking services to more than 10 million customers across over 700 business offices in 19 African countries. With presence in New York, London and Paris, UBA is connecting people and businesses across Africa through retail, commercial and corporate banking, innovative cross border payments, and trade finance.